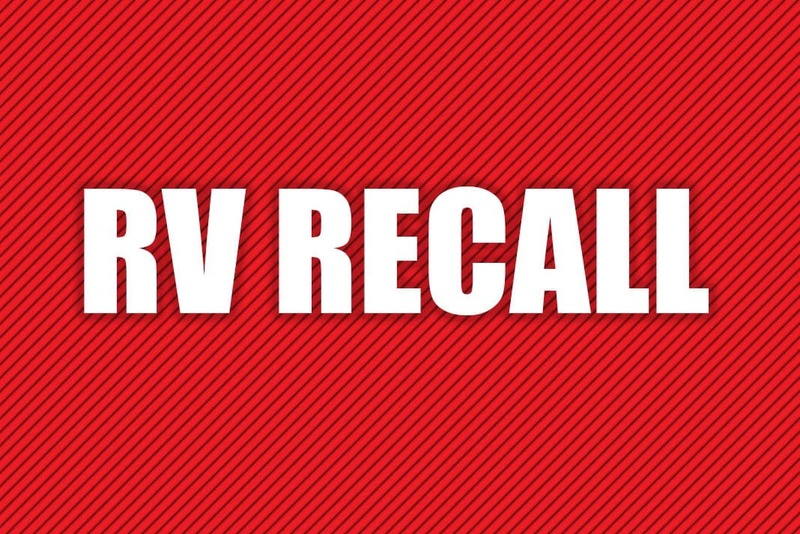 Here is our monthly summary of RV recalls for January 2019 and related equipment we feel are of interest to our readers. This information has been gleaned from the U.S. National Highway Transportation Safety Administration. This is NOT a complete list of all vehicles and related equipment recalled. Please note: Due to the recent partial federal government shutdown, the listings are limited to what was provided by the agency in January. Heartland RV (Heartland) is recalling certain 2019 Heartland Elk Ridge, Milestone, Elk Ridge Express, Pioneer, Sundance, and Sundance XLT fifth-wheel recreational trailers. The forward reflectors on one or both sides may not have been installed. As such, these vehicles fail to comply with the requirements of Federal Motor Vehicle Safety Standard (FMVSS) number 108, “Lamps, Reflective Devices, and Associated Equipment.” If the reflectors are missing, the trailer may have reduced visibility to other drivers, increasing the risk of a crash. Heartland will notify owners, and dealers will install the missing reflectors, free of charge. The recall was expected to begin January 21, 2019. Owners may contact Heartland customer service at 1-877-262-8032. Heartland’s number for this recall is 99.01.43. Keystone RV Company (Keystone) is recalling certain 2019 Keystone Montana recreational trailers. The axles may have defective welds on the spindles, potentially resulting in a spindle and wheel assembly detaching from the axle. If the spindle or wheel assembly detaches from the axle, it can affect vehicle handling and increase the risk of a crash. Keystone will notify owners, and dealers will inspect the axle tag, replacing it as necessary, free of charge. The recall was expected to begin January 21, 2019. Owners may contact Keystone customer service at 1-866-425-4369. Keystone’s number for this recall is 18-342. Ford Motor Company (Ford) is recalling certain 2015-2019 Ford F-150 and 2017-2019 Ford F-250 Super Duty, F-350 Super Duty, F-450 Super Duty, and F-550 Super Duty pick-up trucks equipped with an engine block heater. Water and contaminants may get into the block heater cable’s splice connector causing corrosion and damage. When the heater is plugged in, prolonged corrosion could cause a resistive short, increasing the risk of overheated or melted wiring which can increase the risk of a fire. Ford will notify owners, and dealers will inspect and seal the block heater cable, or replace it, as necessary, free of charge. The recall was expected to begin January 7, 2019. Owners may contact Ford customer service at 1-866-436-7332. Ford’s number for this recall is 18S45. General Motors LLC (GM) is recalling certain 2019 Chevrolet Silverado 1500 Crew Cab and GMC Sierra 1500 Crew Cab vehicles. The passenger-side frontal air bag module may have been damaged during assembly, possibly resulting in the air bag not inflating properly in the event of a crash. In the event of a crash, an air bag that does not inflate properly can increase the risk of injury. GM will notify owners, and dealers will replace the passenger side air bag module, free of charge. The recall began on December 18, 2018. Owners may contact Chevrolet customer service at 1-800-222-1020 and GMC customer service at 1-800-462-8782. GM’s number for this recall is N182198820. Toyota Motor Engineering & Manufacturing (Toyota) is recalling certain 2002-2005 Lexus SC and Toyota Sequoia, 2003-2005 Toyota Corolla and Tundra, and 2003-2007 Pontiac Vibe vehicles. These vehicles are equipped with certain air bag inflators assembled as part of the passenger frontal air bag modules used as original equipment or replacement equipment. In the event of a crash necessitating deployment of the passenger frontal air bag, these inflators may explode due to propellant degradation. An inflator explosion may result in sharp metal fragments striking the driver or other occupants resulting in serious injury or death. Toyota will notify the Toyota and Lexus owners. General Motors will notify the Pontiac Vibe owners. Depending on the vehicle model, dealers will replace the front passenger air bag inflator with an alternate inflator, or replace the air bag assembly that includes an alternate inflator, free of charge. The recall was expected to begin January 14, 2019. Owners may contact Toyota customer service at 1-888-270-9371, Lexus customer service at 1-800-255-3987 or Pontiac customer service at 1-800-762-2737. Toyota’s numbers for these recalls are J0A (Zone A Toyota), J0B (Zone B Toyota), J0C (Zone C Toyota), JLI (Zone A Lexus), JLJ (Zone B Lexus), and JLK (Zone C Lexus). Note: This recall includes vehicles that have had their air bag previously replaced under an earlier air bag campaign. Toyota Motor Engineering & Manufacturing (Toyota) is recalling certain 2008-2019 Toyota Land Cruiser and Lexus LX 570 vehicles. Over time, the seat belt tension sensor wire harness may break and deactivate the front passenger air bag, knee air bag, and passenger seat-mounted side airbag. In the event of a crash, deactivated air bags can increase the risk of injury. The remedy for this recall is still under development. Interim notification letters are expected to be mailed on February 11, 2019. A second notification will be mailed once remedy parts are available. Owners may contact Toyota customer service at 1-888-270-9371 or Lexus customer service at 1-800-255-3987. Toyota’s numbers for this recall are Lexus Interim J2L and Remedy JLL, Toyota Interim J15 and Remedy J05. Toyota Motor Engineering & Manufacturing (Toyota) is recalling certain 2018-2019 Toyota Tacoma vehicles. Improper machining of the brake master cylinder may result in internal damage of one of the seals, affecting brake performance. Reduced brake performance can lengthen the distance needed to stop the vehicle, increasing the risk of a crash. Toyota will notify owners, and dealers will replace the brake master cylinder, free of charge. The recall was expected to begin January 21, 2019. Owners may contact Toyota customer service at 1-888-270-9371. Toyota’s numbers for this recall are J16/J06. Previous articleCan we use bottled water for the RV toilet in winter?